Customers in London get cooled off! – Arcadian Projects Inc. Tenants in a downtown London, 28-story apartment building are cooling off with their new air conditioning. 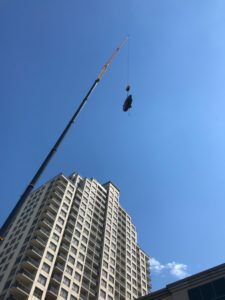 Supporting Trane Service Agency, Arcadian removed a faulty compressor off of a 180-ton chiller and installed a new compressor. The chiller runs the facilities air conditioning.